I always start by boiling the water. Add salt to the water to add flavor to the pasta. When the water comes to a boil, throw in the package of shells. Cook for 8 to 10 minutes, or until the pasta is aldente. You will be backing the pasta later, so it’s better that the pasta be a little on the firm side. While the pasta is cooking, empty the package of ground meat to a sauce pan. You can add a small amount of oil to the ban, so that the meat doesn’t stick. Season the meat with salt, pepper, and garlic salt or powder. Chop one white onion, and the bell peppers. Add the onions and bell peppers to the meat mixture. Brown. When the meat is thoroughly cooked, add the marinara sauce. Mix. Take the bunch of spinach, and remove the leaves from the stems. Rinse. In a separate pan, throw in the spinach with a bit of salt. Let cook until the leaves wilt. Take the spinach and drain. Mix the spinach with the carton of ricotta cheese, a few handfuls of mozzarella cheese, pepper, and parmesan cheese. Take a deep baking pan, and layer the bottom with the marinara sauce. Take a pasta shell and fill it partially with the meet mixture. Then add half a spoon full of the spinach and cheese mixture. Place the shell into the pan, and repeat. Once you have finished stuffing all of your shells, top the shells with marinara sauce, shredded mozzarella cheese, and parmesan cheese. Set the oven to 325, and let the shells bake. If you don’t want the top of the shells to get crunchy, put a piece of foil over the top of the pan while baking. 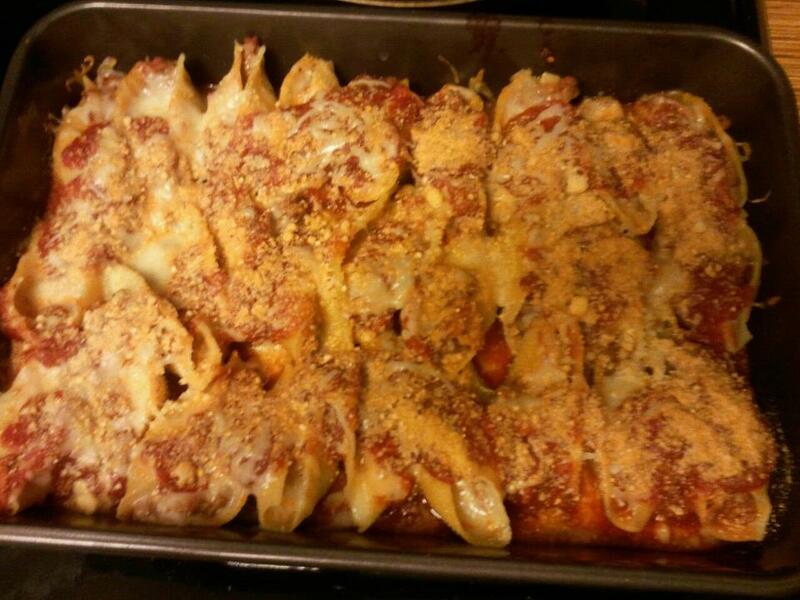 When the cheese has melted on the top your me~shells are ready. Serve them with garlic bread, caesar salad, and wine. Enjoy!